From 1979: the first issue of the British STAR TREK THE MAGAZINE (actually an unlicensed fanzine). As is often the case with fanzines, I know very little about this one. Its obviously unlicensed and published around the time of The Motion Picture. 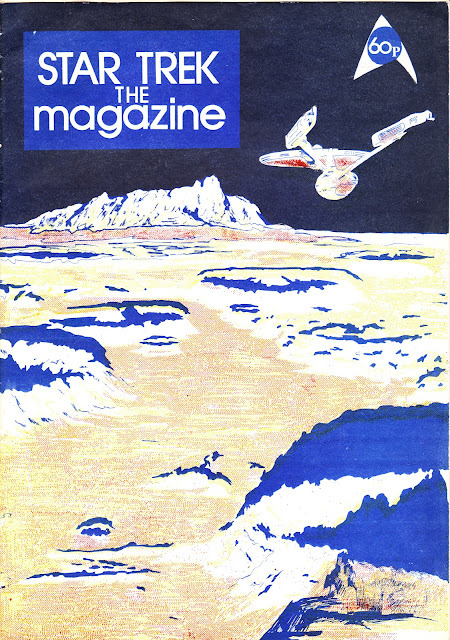 Note the movie-era Enterprise on the cover. I picked this up from a dealer, for a couple of pounds, earlier this year because it looked cool and - frankly - you never know how many of these things are still out there. That said, I don't generally endulge in fiction 'zines. You could fill a while library with those and, to be honest, I would never read them. Although some of the more racy "slash" stuff might be eye-opening. I wonder how many fan writers had guessed that Sulu's alter ego was already living the dream? A rare and valuable find, trek's 60's counterpart LOST IN SPACE also generated many fanzines of wildly variable quality. I have a book on the show ( acquired many years ago from star tech ) which lists many of them and the writer certainly didn't mince words in his critique of how bad most of them were.